Upon my first glimpse at this book’s synopsis, I wasn’t fully convinced to pick it up. I don’t know, something about it just steered me away. One day, however, I had a change of heart- I couldn’t resist seeing what was behind that adorable cover. 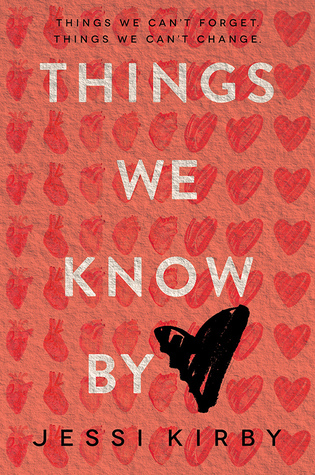 In brief, my process of picking up Things We Know by Heart was due to a big case of cover love! This book blew me away, and even that is an understatement. After having read this one, one thing I can say for sure is that it has earned a special spot in my heart. Almost everything about it was absolutely perfect- I felt extremely engaged and emotionally connected to its plot and characters. I liked Quinn as she was extremely kind, however I didn’t particularly appreciate the fact that she kept the secret about her boyfriend’s heart from Colton for so long. Nevertheless, I do understand that it was to have a bond with him without all of the pressure from the loss of Trent, and thus I respect this. In my opinion, everything else about her made her very likeable and memorable. I LOVED Colton even more than Quinn! He’d gone through so much trouble and yet stayed so strong, and while reading I could just picture him as this gorgeous, dreamy-looking guy. I shipped Quinn and Colton so hard, but at the same time I wanted a little bit of Colton all to myself. Do you get what I’m saying?! This book had the perfect length and pacing. At just over 300 pages, even the slowest readers will be able to finish this book in a jiffy. I was kept on my toes and sucked in throughout the entire story. I also found that the writing was straight to the point and very engaging. Every word had its relevance in the novel, and I much prefer that to books that go on and on about how a character’s outfit looked that day. To sum it all up, if I had the time and the patience to, I would learn every word of this book by heart. It was absolutely astonishing and I doubt I could have had a better time reading it. Unlike many fluffy books I read, this one definitely gave me some feels but stayed fluffy at the same time- it had great emotional balance! If you are into gushy and cheesy (in a good way) contemporaries that break your heart in the beginning and then sew it back together by the end, then Things We Know by Heart is the one for you. I think this is the perfect book for me right now, I need fluffy and heart melting in my life right now. Wonderful review Kayla.